There may be times when you’ll want to use both OneNote for Windows 10 and the full desktop version of OneNote 2016 on the same computer. When it detects multiple versions of OneNote, Windows may prompt you to select the version of OneNote that you want to use as the default app for opening future notebooks. If you miss this prompt or you change your mind about your selection, you can manually change this setting at any time. Press the Windows button in the lower-left corner of your screen, and then click Settings. 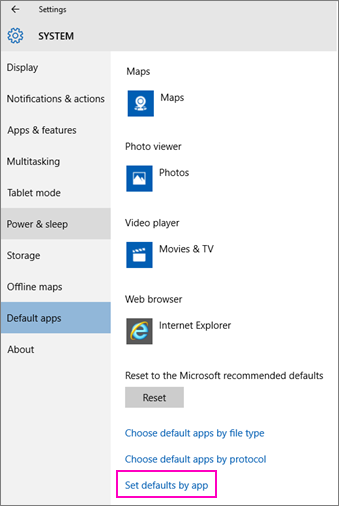 In Settings, click System > Default apps > Set defaults by app. In the list under Set your default programs, find the version of OneNote that you'd like Windows to use as the default, and then click Set this program as default. For example, click OneNote (desktop) if you want to always open notebooks in OneNote 2016. To change this setting at any time, repeat the steps in the preceding list and make a different selection.